The earliest record I was able to locate for this property was in the 1901 Indianapolis City Directory, published by R. L. Polk & Co. 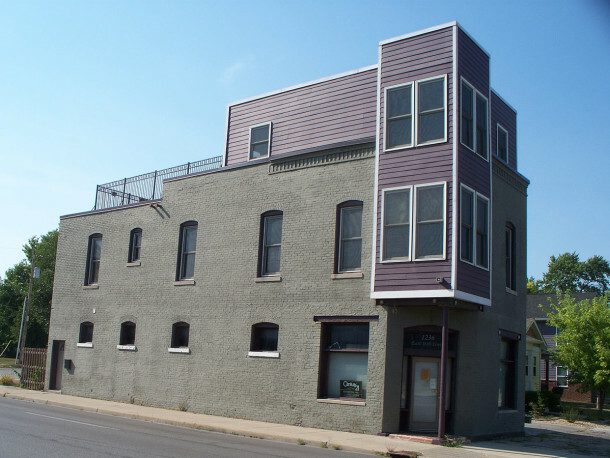 Both the commercial space on the main level of the building and the living space above it appear to have had the same address, which at that time was 1602 N. Columbia Avenue. The original use of the space on the first floor was as a saloon. The proprietor of the business and his young family resided in the apartment on the second floor. 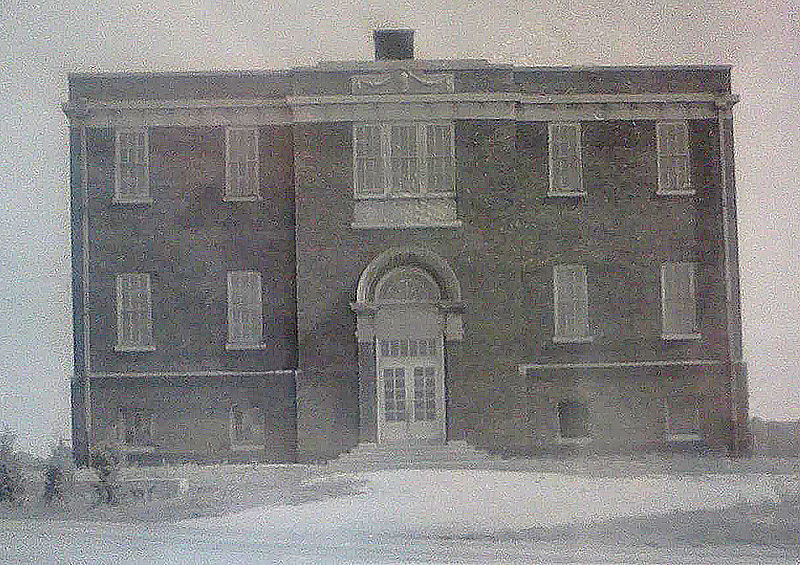 In 1901, the apparent owner of the two-story brick building was named Frank H. Hegarty. Frank was born in 1868 in Kilcar, County Donegal, Ireland. He immigrated to the United States in 1888, along with his brothers, James and Patrick. Frank Hegarty married Anna Murphy in Indianapolis in 1896. She was born in Ireland in 1872. 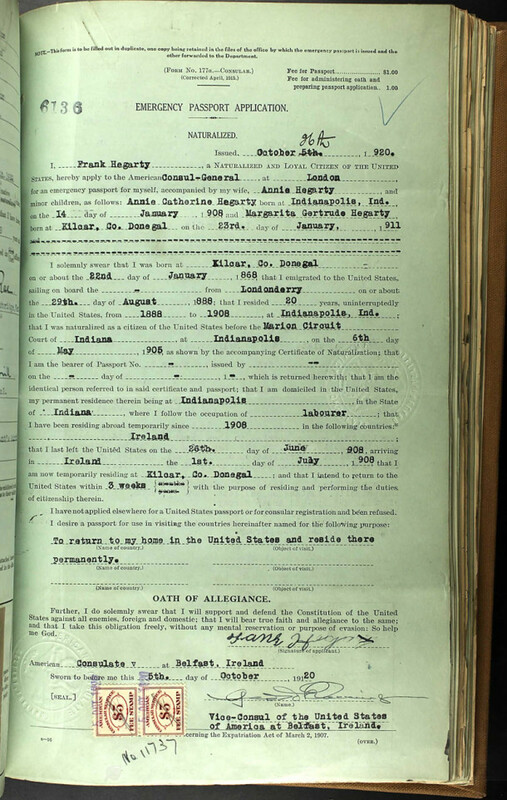 In 1905, Frank and “Annie” became U. S. citizens. They had four children, three of whom died in childhood. 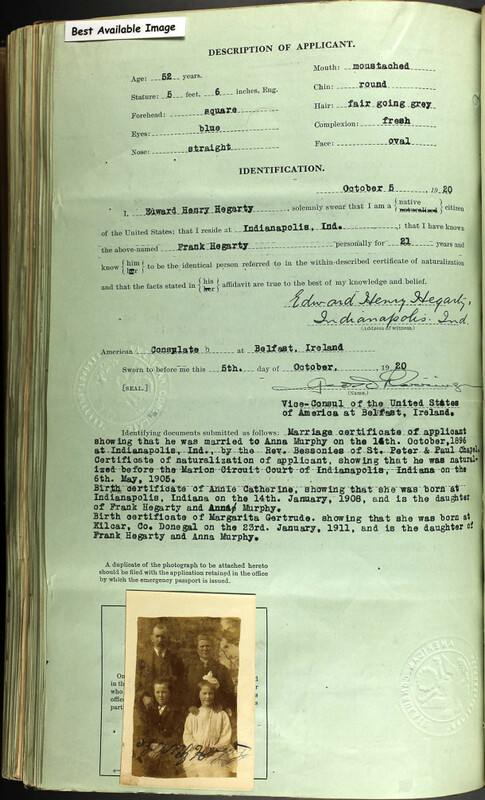 After the death of the third child early in 1908, Frank and Annie and their one surviving child, five-month-old Annie Catherine, left Indianapolis for Ireland, where they resided in Hegarty’s birthplace, Kilcar, for more than twelve years. During that period, another child was born, Margarita Gertrude. The family of four returned to Indianapolis in the autumn of 1920, and Frank briefly ran a grocery store at 1901 Yandes Street. 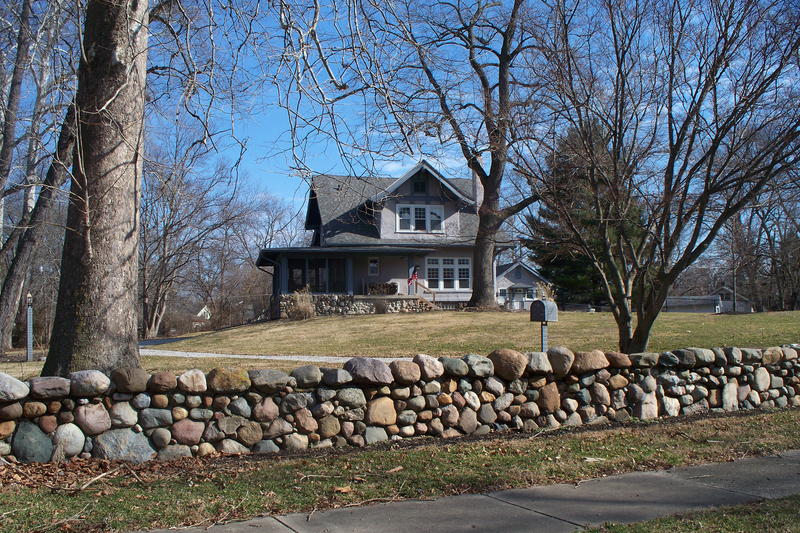 In their senior years, Frank and Annie Hegarty resided at 4220 Ruckle Street. There is no longer a house at that address, because a short section of Ruckle Street has been vacated in recent years, and the former site of their home is now part of the playground at St. Joan of Arc School. 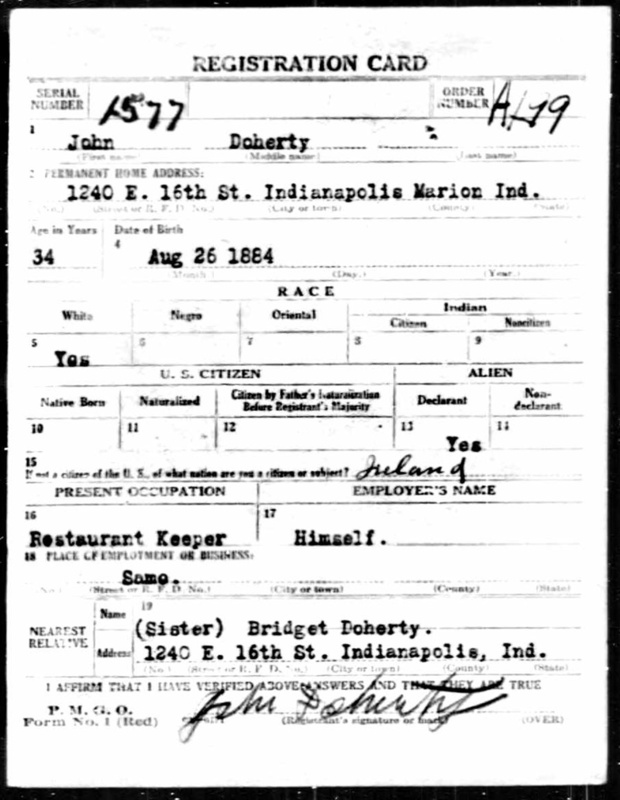 After the Hegartys left the United States in 1908, Frank, Michael, and John Doherty operated Doherty Brothers Saloon at 1602 N. Columbia Avenue for about a decade. The young men lived together in the apartment above the saloon. 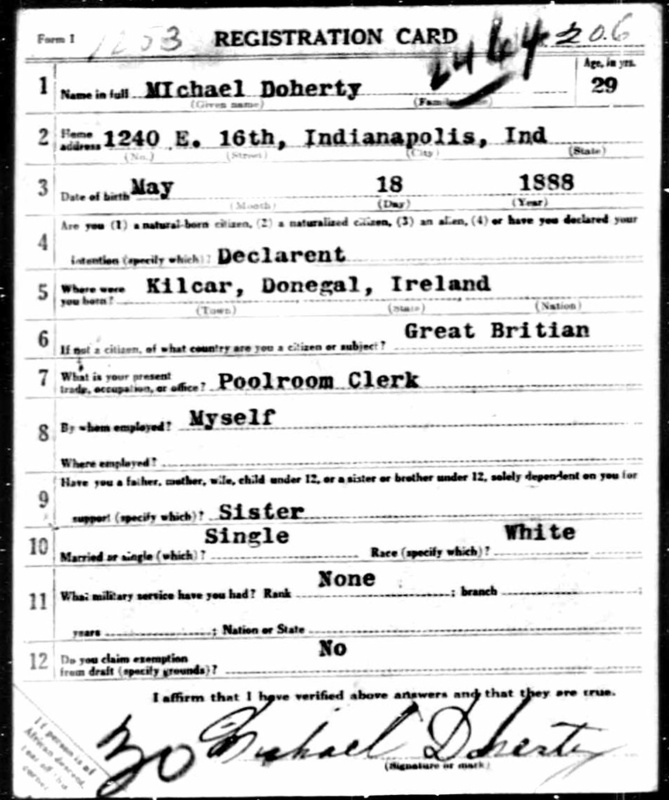 The Dohertys were also Irish immigrants, having come to the United States in 1902 from the same town in County Donegal as Frank Hegarty, Kilcar. It’s conceiveable that the Hegartys and Dohertys were related. Several different addresses have been associated with the property over the years, which made it a little harder to research than if it had only had one. Some were E. 16th Street addresses, and some were Columbia Avenue addresses. This was partly due to the fact that early in the building’s existence, a one-story frame structure was added at the west end of the two-story brick building to accommodate some pool tables. The pool hall had its own separate entrance facing 16th Street, and the original brick building had two entrances –- one facing the 16th Street side of the building that led to the apartment on the second floor and one on an angle at the corner of 16th and Columbia that opened into the first floor commercial space. In 1918, two of the three Doherty brothers filled out World War I Draft Registration Cards. However, I could find no records indicating they actually served in the Great War. Neither could I find any other kinds of records for any of the Doherty brothers after 1918. Perhaps they, like the Hegartys, returned to Ireland? In the 1919 city directory, Max Pollock sold soft drinks in the building. He resided at 1528 N. Columbia Avenue, less than a block away from the subject property. 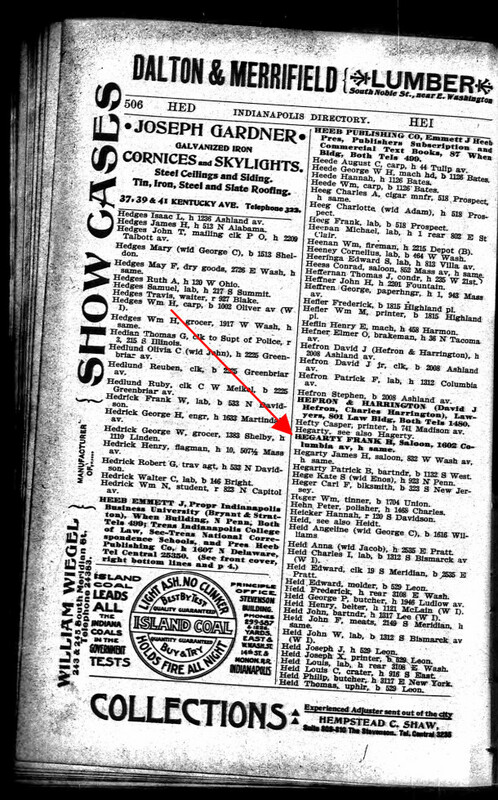 In the 1920 directory, the address was listed as vacant. In the 1921 directory, Littleton E. Richardson was selling soft drinks at 1602 Columbia Avenue. He lived at 2350 N. Sherman Drive. At the time of the 1930 Indianapolis City Directory, there was no listing for either 1236 E. 16th or 1602 Columbia Avenue, but there was a James E. Gates operating a poultry business at 1240 E. 16th Street. As there is no other building in the 1200 block of E. 16th Street that’s further east of this one, 1240 E. 16th Street had to be the same building that’s now known as 1236 E. 16th Street. In 1931, 1236 E. 16th Street housed a fish market owned by Italian immigrant Angelo Amore (1890-1967), and 1602 N. Columbia Avenue was the location of a meat market owned by Lawrence G. Cain (1905-1987). 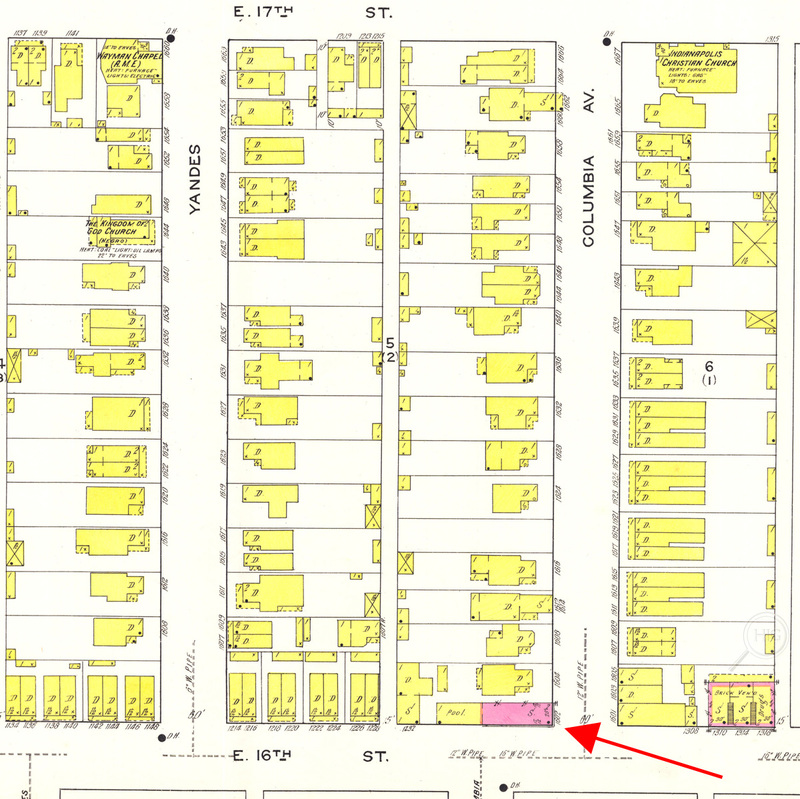 In the 1932 city directory, Angelo Amore was selling fruit at 1236 E. 16th Street. Cain continue to operate a grocery at 1602 until about 1935. From 1935 to 1958, Tashe George Popcheff (1888-1965) and his wife Shena (1890-1969) operated a fish and poultry market at 1236 E. 16th Street. The Popcheffs had immigrated to the United States from Macedonia at the outbreak of World War I. They did not reside in the property, but lived at 232 N. Douglass Street. That address no longer exists, as the ground on which their home stood is now part of the IUPUI campus. From 1940 to 1950, William J. Ponder ran a grocery at 1602 Columbia Avenue, as well as other locations around town, which he called Regal Stores. The Popcheffs continued to occupy 1236 E. 16th Street. Mrs. Cleo Oliver resided at 1242½ E. 16th Street in 1940, as did Garfield Smith in 1945, and Charles H. Smith in 1947, so 1242½ must have been the address of the second story apartment during that time period. 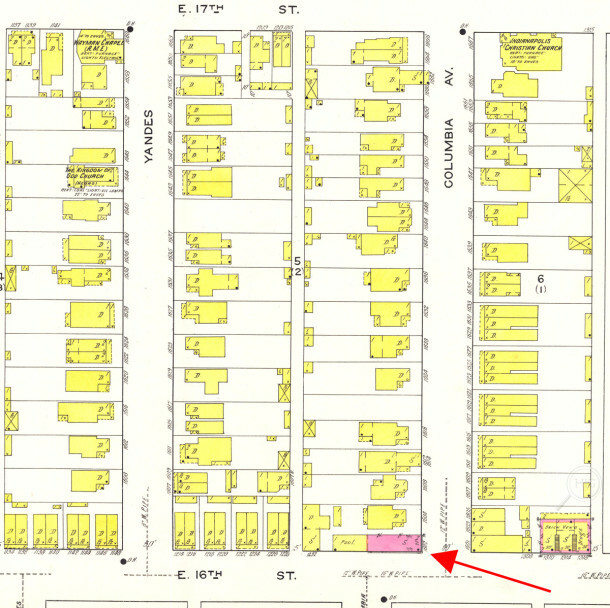 In 1949, a physician by the name of Gerald S. Lowery had a medical practice at 1238 E. 16th Street, which must have been yet another address for the second floor. In 1950, the property was purchased by Robert F. Erskine (1911-1992) and silent partner, Paul W. Sylvester. 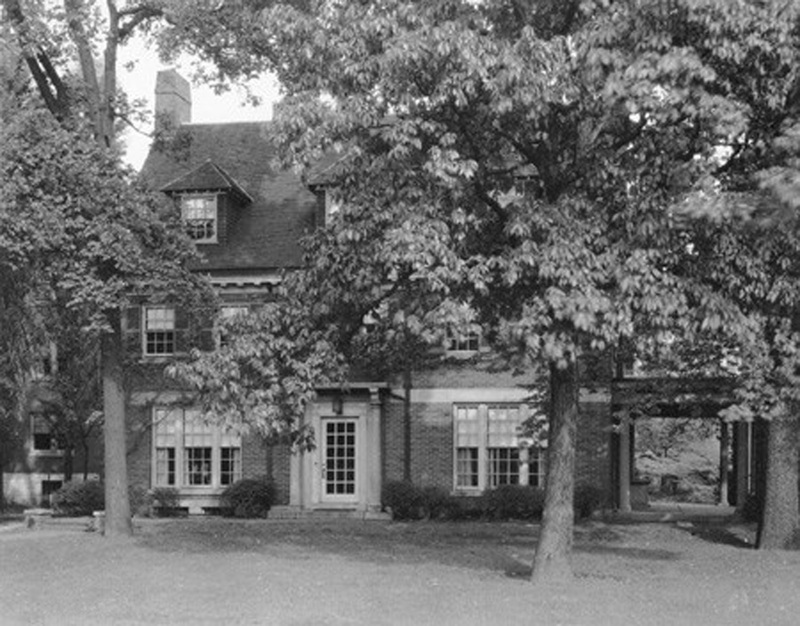 Erskine lived at 4306 Park Avenue in what is now the Meridian-Kessler neighborhood. Sylvester and his family lived at 1421 Sturm Avenue in what is now the Holy Cross neighborhood. In the early years of their ownership, they called the grocery Erskine’s Regal Market. In later years, the word “Regal” was dropped from the name. Sylvester’s son, Gerald, worked in Erskine’s Market when he was a high school student. In 1972, Erskine sold his ownership in the business to the then grown Gerald Sylvester and his wife Rosalind. The Sylvesters kept the name Erskine’s Market, since it was already an established entity in the neighborhood. From 1958 to 2005, Joe and Rozzetta Cumberlander operated Joe’s Fish Market in the frame addition at the back (or west) side of the brick building. Joseph Cumberlander’s family had moved north to Indiana from Fredonia, Alabama in the mid-1950s. Joe married Rozzetta Moore in 1957, and the two embarked on a business that lasted nearly five decades. The Cumberlanders did not reside in the property either, but lived on Byram Avenue in the Butler-Tarkington neighborhood in the early years of their marriage. The Cumberlanders moved to Kessler Boulevard North Drive in later years, where they still reside today. 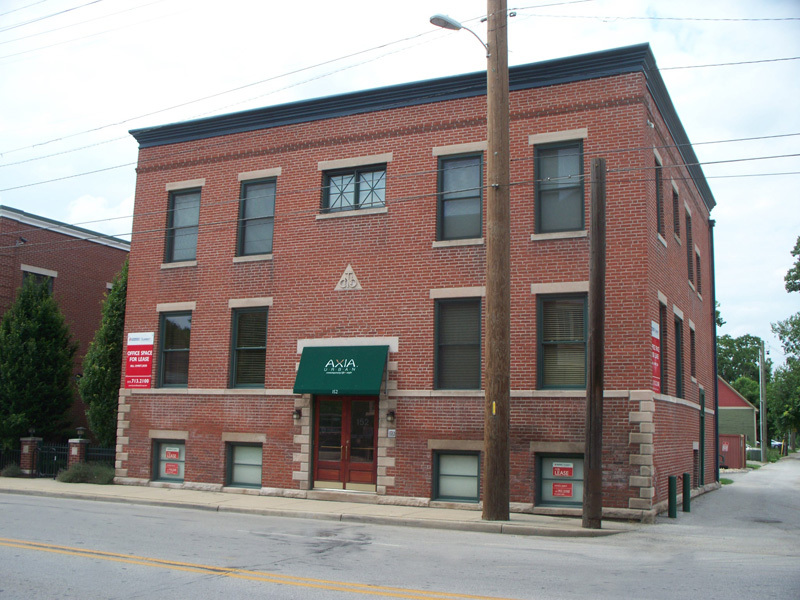 In 2003, the Sylvesters sold the property to Martindale Brightwood LLC. It was organization created to manage Martindale on the Monon, a housing development of new and rehabilitated homes in the area bounded by 16th Street on the south, 22nd Street on the north, College Avenue on the west, and Dr. Andrew J. Brown Avenue on the east. Although some of the plans envisioned for the project were realized, the decline in the real estate market and the collapse of the banking system resulted in the redevelopment effort’s being disbanded. Located in the Martindale-Brightwood neighborhood, the more-than-a-century-old building is currently known by the address of 1236 E. 16th Street. It houses the offices of Development Concepts, Inc. (DCI), one of whose principals is Mike Higbee, the former Director of Indianapolis’ Department of Metropolitan Development. Although the brick exterior has been painted over and there have been more contemporary-looking additions (modern windows and an enclosure on the roof) the original personality of the building is still evident.